Festivals & Events Archives - Art Matters! >From London, to Broadway, to Ashland! 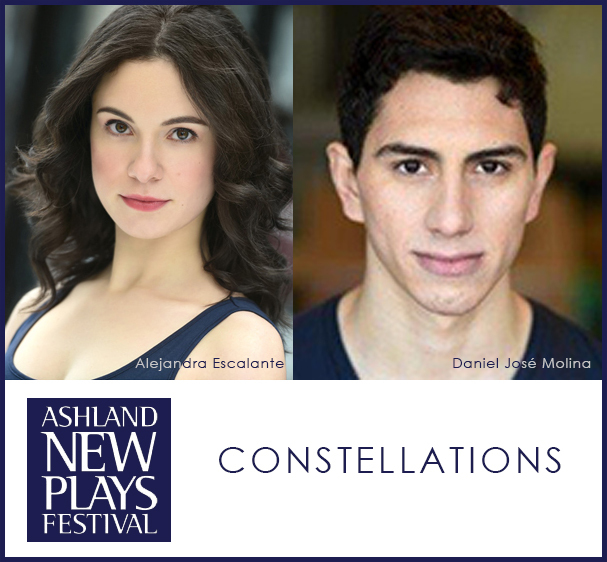 Join us for this special, one-night-only dramatic reading of the “spellbinding, romantic journey” of CONSTELLATIONS. What begins as a simple encounter between a man and a woman then delves into the infinite possibilities of their relationship and asks us to think about the difference between choice and destiny. ANPF’s staged reading is directed by ANPF’s Associate Artistic Director Jackie Apodaca and stars Oregon Shakespeare Festival’s Alejandra Escalante and Daniel José Molina, who also starred together as the title characters in OSF’s 2012 production of ROMEO AND JULIET. This season at OSF you can see them in HENRY IV, PART ONE and TWO. “I feel lucky to be able to explore this text with our wonderful cast in what are sure to be honest and nuanced performances. Not only will they need to live through their characters’ stories, but to live them repeatedly, variably, as the story flitters between universes,” says Apodaca. The dramatic reading will be held on Monday, May 8, at 7:30 p.m. at the Unitarian Center, 87 Fourth Street, in Ashland. Tickets are $20 and are available online and at the door. For more information or to purchase tickets, visit ANPF’s website at www.ashlandnewplays.org. ASHLAND, Ore. — In the basement of Mix Bakeshop, Beth Kander began the first rewrites of her new play, Hazardous Materials. It was fall 2015 and her play The Bottle Tree was one of the four winning plays for Ashland New Plays Festival’s flagship event that year. ANPF is a non-profit organization celebrating its 25th year of encouraging playwrights in the creation of new works. The organization offers public readings of selected plays and educational forums to the community through discussions and workshops. ANPF’s Festival Week runs October 19 through 23, with matinee and evening performances each day as well as a playwriting workshop on Saturday, October 22, led by Oregon Literary Fellowship recipient and ANPF Host Playwright EM Lewis. This year’s winners are Beth Kander for Hazardous Materials, Stephanie Walker for The Madres, Mike Teele for EdanEv, and Michael Erickson for Oberon Springs. Hundreds of playwrights submit new works to ANPF each year, and the winners are chosen by a cadre of local volunteer readers and ANPF’s Artistic Director, Kyle Haden. During the festival, the winning plays are presented as dramatic readings, directed and acted by individuals from Oregon Shakespeare Festival and Southern Oregon University. All the winning playwrights agree that the opportunity to share their work with actors, directors, and audiences strengthens their plays. “My work can only be stronger when working with directors, set designers, actors. We are better together,” says Kander, her sentiments echoed by Walker, Teele, and Erickson. Our feature, “Better Together,” introduces you to each of the playwrights and their new plays. Click here to download the pdf file. Learn more about ANPF and see the complete performance schedule at www.ashlandnewplays.org. A bit closer to Long Beach, Washington, the Chinook Arts Festival will also be taking place on Labor Day weekend. This festival features blown glass, stained glass, photography, jewelry, oil and watercolor paintings, pottery, wood sculptures and more. Come witness the work of the many incredibly talented artists who reside on our beautiful peninsula! Go to the coast for the holiday and enjoy the Coast Redwoods Art Association’s 2016 Art & Craft Show at Crescent City Cultural Center! Ashland, Ore — Scott Kaiser, the multi-talented member of the artistic staff at Oregon Shakespeare Festival (OSF) for the past 26 years and its current Director of Company Development, was interviewed by ANPF’s Mary Silva about his play, NOW THIS, which will be presented as a dramatic reading in Ashland later this month. Kaiser talks about the play, his motivation and his history as a professional playwright, author, actor and teacher. ANPF will present NOW THIS on Monday, May 23 in the Great Hall at the Unitarian Center, 87 4th Street beginning at 7:30 p.m. Directed by Sara Becker, the play features a cast of 14, including Kaiser, ANPF artistic director Kyle Haden, several noted actors from OSF and a few visiting artists in this compelling look at the destructive influence of consumerism on American society. These talented actors bring to life the troubled and troubling characters of the fictional town of Purple Mountain, where young Joey Adderall takes us on an unforgettable ride through his final days of a life coming apart at the seams and his fatal response to a place where everything is less than he wants and more than he needs. MS: First of all, I’d like some background: a bit about where you grew up and where you’ve lived and worked, your educational experience, and what drew you to life in the theater. Anything in your life that you feel contributed significantly to your taking this direction. SK: Like so many theatre people, I struggled to find a niche for myself in high school, but the theatre kids accepted me with all my awkwardness and quirks when no one else would. So I stuck with it. As a teenager, I did summer stock all over New England. In my twenties, I earned three degrees in theatre, which, to be honest, is a bit ridiculous: a BA from the University of Michigan, an MFA in acting from the University of Washington, and a voice studies degree from the Royal Central School of Speech and Drama in London. In my thirties, I joined the artistic staff at OSF. And now I’m in my fifties, and still at it. MS: What might you have done for a living if you hadn’t gone into the theater? SK: When I was a young man, I wanted to be an architect. I’ve always loved looking at buildings and learning about how they were designed and constructed. And to this day, when I see a bit of unfamiliar text—a poem, a speech, a play—I look at it the same way I look at a building, peeling back the facade in my mind to examine the foundation, the framing, the walls, the stairs, the doors. MS: After directing/acting/overseeing the work of other actors, when and why did you begin writing plays of your own? piloted as “the 12th slot model” back in 1998, which has since become the Black Swan Lab for New Works. MS: What motivated you to write Now This? SK: Years ago, the characters in this play starting talking to me in my sleep, so I began writing down what they had to say to me on little scraps of paper. And eventually, I’d collected hundreds of scraps of paper—words, phrases, speeches, and dialogues— written out in complete darkness in the middle of the night. The material on all those scraps, after a great deal of shaping and polishing, with some guidance from the poet Dylan Thomas, became this play. MS: What is it that you hope people will think about/take away from the play? What one thing would you like people to be thinking about when they leave the performance? SK: I’d be pleased if people would become more conscious of how American consumer culture effects nearly every aspect of their lives. MS: Now This seems to draw a strong connection between consumerism and gun violence, an idea that I hadn’t really thought about before. How would you describe this connection? SK: I won’t pretend to know what goes on in the hearts and minds of individuals who choose to carry a weapon to a public place and slaughter fellow human beings. But thiscountry has a serious problem with guns, and I believe the root cause has something to do with a consumer culture that incessantly promises that love and contentment can be bought. MS: How do you feel about having Now This chosen to be read by the Ashland New Plays Festival? Even though the play has already been produced, what new or different aspects do you think this reading might bring to the play? SK: Purple Mountain, the small town depicted in NOW THIS, has a lot in common with the City of Ashland, so I’m very pleased that the play, at long last, will be read here in my home town, and by a fantastically talented group of actors. MS: You’ve been a long time Ashland resident. What do you like about life here? What drives you crazy? What do you do when you’re not doing theater-related stuff? SK: I travel a lot for work, which is a privilege because I get to see how other people live in this country. And life is much tougher out there. So it’s always good to come home to Ashland, where life is slower, where we enjoy tall trees, and open space, and clean water, and fresh air—precious things that, sadly, millions of Americans don’t have in their lives. So I do a lot of walking, many miles every day. MS: I know there are a lot of things I haven’t asked you, but for purposes of this piece, is there anything you’d like to add that I haven’t asked? SK: If you miss Now This, you can see my newest play, entitled Shakespeare’s Other Women, at Southern Oregon University in the winter of 2017.